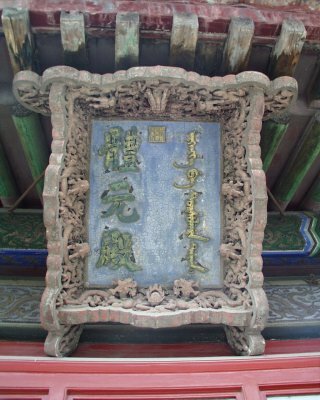 The Hall of Manifest Origin (Tiyuan dian) was established on the sites of the Gate of Eternal Spring (Changchun gong) and the former rear part of the Hall of Supreme Principle (Taiji dian). It has a front door and a back door, serving as a passage hall connecting the Palace of Eternal Spring and the Hall of Supreme Principle. The back veranda is a theatrical stage. In 1884 on the 50th birthday of the Empress Dowager Cixi, she watched the opera performed here from the Palace of Eternal Spring.